Essential oils are used to treat the whole person so that the mind and body are in harmony. The oils are individually blended after an initial consultation, to provide a unique, relaxing experience whilst calming and energising the senses. The oils trigger responses which have a positive effect on the mind and body, causing a deep sense of well-being. A beautiful compliment to the massage is the lovely hot compress and essential oil inhalation. 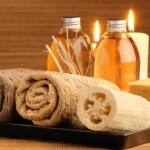 Throughout March and April Linda will be offering Aromatherapy Massage with 50% OFF. There is nothing more important than the well-being of oneself to enable the body to function well.